Facebook has launched a new feature called ‘Save’ that allows people to save anything from their newsfeed, be it a music list or a movie share, a status or an article that they missed the first time or didn’t had time to read it, to later access it using the ‘Save’ feature. There are a lot of people with hundreds of friends and sometimes, it’s not possible to read everything in one go. This was a much needed feature that was missing from the social media site. Things that people like on their newsfeed but don’t have enough time to properly go through it, they can save it to see it later. In order to save something from the timeline, user has to click/tap on the top right corner of the story/newsfeed item that they want to save. From there, put it inside the ‘Save’ menu that can be accessed via ‘more’ tab in their smartphones or tablets. According to Facebook, people can save places, movies, TV and other items in the Save list. Before the announcement of the new feature from Facebook, the only way for user’s to read some articles was purely based on the Facebook algorithm which showed only selected number of articles on the person’s newsfeed, depending on their interests and shares with other people. This is not the first time that a site had offered a feature like that. Instapaper and Pocket apps are already providing this feature to its users, making it easier for them to save something that they find interesting on the Web to read it later. Currently, the Save feature is an online feature and requires internet connection. People using Facebook on planes or at places with no internet service available, they cannot use this feature to save entries from their timeline. 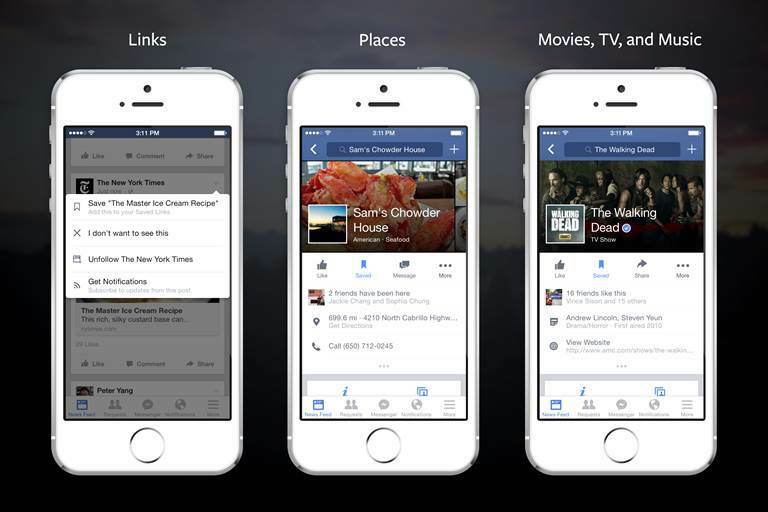 According to Facebook, the new feature will start rolling out to iOS, Android and on Web in the upcoming days.